Huawei might be having a tough time penetrating the U.S market over allegations of spying and links to its country Government, the Chinese firm obviously is having a swell time in other markets, and it appears it isn’t perturbed by threats from the Trumph administration. The Chinese tech giant at an event in Paris on March 26 will be unveiling the Huawei P30 and Huawei P30 Pro, but just before then, the firm has today confirmed it has some pleasant surprises up its sleeve. The firm has scheduled a launch event for March 25 and isn’t event leaving us guessing. The event schedule comes in the form of posters with sketches, names and some brief specs of the three products it will be unveiling on the said date. The Huawei Mediapad M5 youth edition, the Huawei Enjoy 9S, as well as the Huawei Enjoy 9e will all be debuting on the said date. 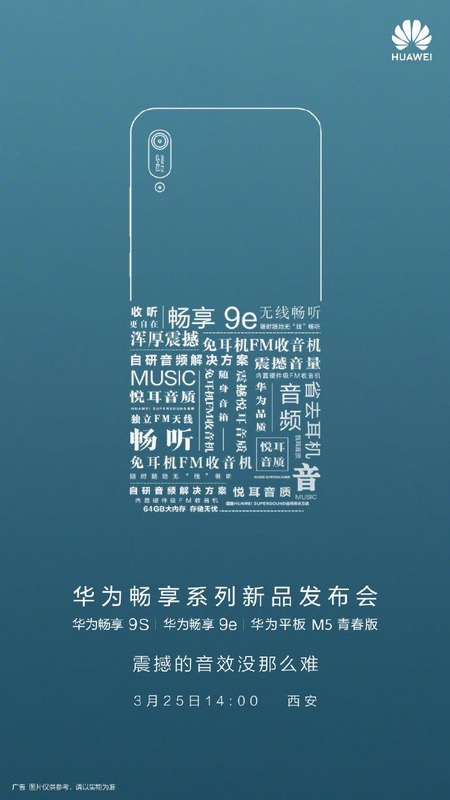 While a Weibo leak from earlier this month suggests the Enjoy 9s will join the waterdrop notch bandwagon, Huawei latest poster says the device will be getting a vertically aligned triple setup consisting of a 24MP primary camera and a 16MP ultra-wide angle camera, a rear fingerprint scanner, run EMUI 9.0, a couple of AI features as while it will boot Android 9 based EMUI 9.0 out of the box. 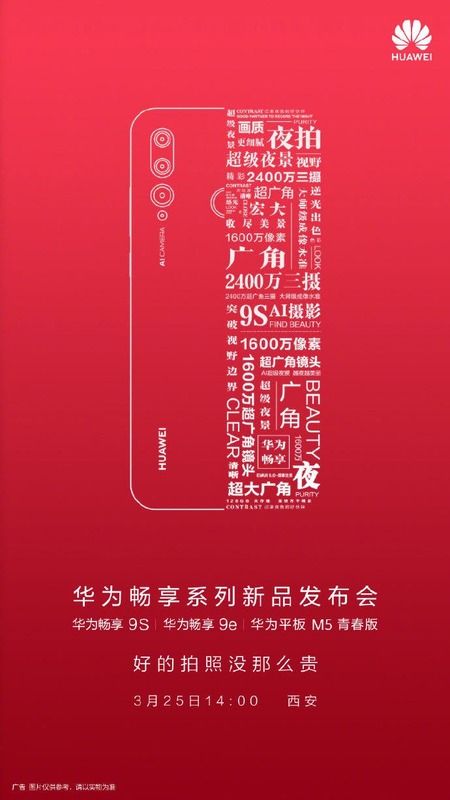 Huawei has only released a few details about the Huawei Enjoy 9e, and from the look of it, the device will arrive as a much more affordable variant of the Enjoy 9S. From the poster seen below, there appears a single 13MP rear camera, no fingerprint sensor, though we are not sure if it has been relocated to the front. The device will get Huawei SuperSound technology, 64GB of storage, while a TENAA listing reveals it will come equipped with an entry-level chip, possibly a MediaTek Helio P35 processor. The Mediapad M5 youth edition on the other hand as per the poster is billed to come with Huawei’s Kirin 710, a 5,100mAh battery as well as Huawei’s Histen 3D audio on board.